Two decades ago we were confronted by the end of the Soviet Union and collapse of the geo-political divisions that had defined much of the twentieth century. From this particular end, the ‘end of history’ was proclaimed. But is it still possible to argue that liberal democracy and free market capitalism are the final form of law and mode of production in human history? Recent events have called this into question: 9/11, the War on Terror, global economic collapse and looming ecological crises. It seems that history if far from over. And, yet, the question of ‘the end’ has returned in the often predicted, but still uncertain, establishment of a new international American Empire or a new era of International Law, and the resurgence of religion as a dominant source of political identification. On the other hand, perhaps the ‘end’ is still to come, slowly accumulating, mustering at the periphery of the geo-political landscape and outside the productive sphere. Responses taking up these issues range from a return to universalism, political theology, Messianism, and even the specter of communism. 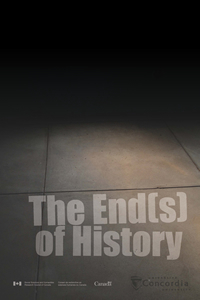 This project, entitled Ends of History, seeks to explore what is at stake in proclaiming ‘the end’ in the current historical moment. Is it a matter of reading the writing on the wall? Is the proclamation itself a political act? Furthermore, is there a desire for the ‘end’ that conditions the possibility of the proclamation(s) themselves? By asking these questions, we seek to confront the various ‘ends’ that we now live, and in so doing open new lines of sight into the future.